ALL Faith Formation volunteers (Catechists, Office Assistants, Hall Monitors, Teen Aides, and Substitutes) will need to complete this form. NOTE: It is recommended that this form is completed on a tablet or computer. Please do not complete the form on a phone. You are welcome to come into our office and complete the form using one of our computers. In order to assist our children to grow in holiness and become more fully the persons God created us to be, our volunteers must be practicing Catholics in full communion with our church and closely follow The Precepts of the Catholic Church. In addition, our catechists must be willing to facilitate the provided curriculum. 1. To attend Mass on all Sundays and holy days of obligation. 2. To fast and abstain on the days appointed by the church. 3. To confess our sins at least once a year. 4. To receive Holy Communion during the Easter season. 5. To contribute to the support of the Church. In addition, I agree to observe the laws of the Church concerning marriage. I affirm that I love God with all of my heart, soul, and strength and to participate in sharing the Good News of God's love with all people in a spirit of compassion and charity. While we cannot guarantee that you will be assigned to volunteer in the position you request, we will make every effort to address your interest, comfort level and availability. We assign volunteer positions on a first come, first served basis. Thank you for volunteering to share your faith with the children of our parish community! We are truly grateful and blessed to have you acting as a partner in faith with us. 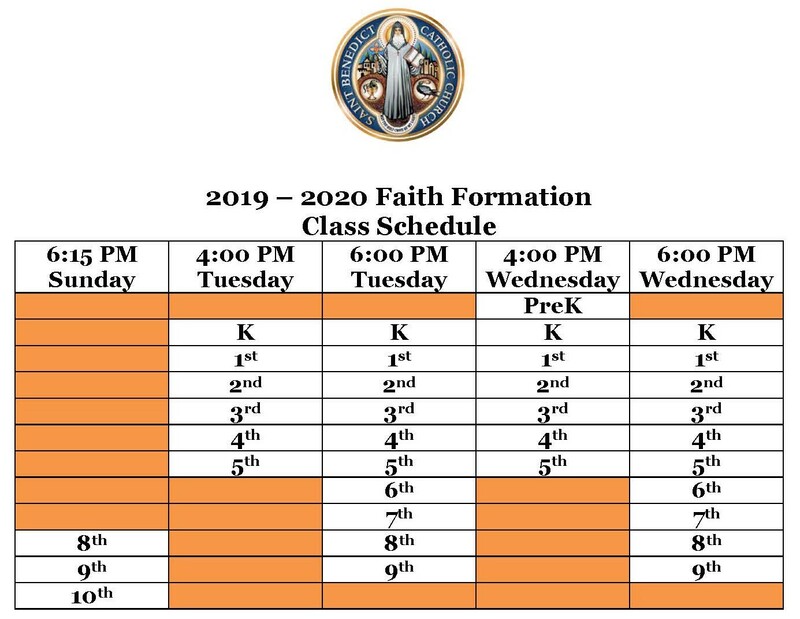 Please register your child(ren) for classes using the Faith Formation Registration Form on our website. I have read, understand, and agree to abide by the requirements to be a volunteer at St. Benedict Catholic Church. If yes, where (Please include city)? Adults and youth who serve in Faith Formation ministries must complete Safe Environment screening and attend VIRTUS training as required by the Archdiocese of Atlanta. I understand and am willing to comply with these requirements to be a volunteer at St. Benedict Catholic Church. * CATECHIST - Teacher for a class; Full year commitment and a training day in August; this is the position we most need to fill! * OFFICE HELP/HALL MONITOR - Assist with administrative duties weekly and sit in hallway during classtime (monitor student and teacher needs). Limited spots available. * SUBSTITUTE - PreK-9th grade catechist as needed. * TEEN AIDE - Opportunity for a high school student to assist catechist(s) in class on a weekly basis; Full year commitment; Must be high school student. * YOUTH MINISTRY ADULT VOLUNTEER - Adult volunteers needed on Sunday evening (6:15 p.m.) to lead our 10th graders in small groups in the PLC. NOTE: Volunteers are eligible to receive 50% discount on your child(ren)'s faith formation registration fees when you volunteer in one of our qualified positions. Please list your child(ren)'s name(s) and grade(s). If you're volunteering as a catechist, would you like to teach your own child? Please provide full name of the person you would want us to contact in the event of a medical emergency. I, the undersigned, legal adult, do hereby give consent to any x-ray, examinations, anesthetic, medical or surgical diagnosis, treatment or procedures and hospital care which is deemed advisable by, and is suggested, recommended, prescribed, or directed by any physician or surgeon duly licensed to practice in the State of Georgia. It is understood that if I am incapacitated, effort shall be made to contact my emergency contact prior to rendering treatment, but that any of the above treatment(s) will not be withheld if the undersigned cannot be reached.